By Stephen Tharrett and Mark Williamson, ClubIntel. At some point in every small business’ lifecycle comes a time when they have to decide whether to become a member of an industry association. Industry associations by their very nature are formed to provide a collective voice to help an industry grow, to protect it from damaging legislation, and promote it to the public and investors. As is evident in the mission statements of these two long-time industry associations, they exist to provide their members with the knowledge, resources and a voice that will allow them to achieve their goals. Analyzing industry performance data (i.e. client/member usage, client/member retention/attrition, financial metrics, compensation and employee metrics) that offers business owners key benchmarks to assess and improve their own performance. Studies that offer insights into consumer attitudes and behavior that can provide operators with information to help them market, sell and program their businesses. Promoting the research findings to investor groups (e.g., angels, venture capital firms, private equity firms, and even lending institutions) to help them understand the industry and assess the suitability of investing within it. This support is essential to growing any industry and has been one of the driving forces behind the growth of the fitness industry. Promoting research findings to key media outlets that can then leverage that information to build consumer awareness and consumer appeal for the offerings of a particular industry, such as boutique fitness studios. I have been a member of IHRSA since 1984 and am also a member of several other industry organizations, including AFS. These association memberships have allowed me to stay abreast of the respective industries and to ideate strategies to keep my businesses one step ahead in a very competitive landscape. Access the research data only through AFS to better understand what to pay your front-line staff, what to charge for sessions and more. Data pulled from hundreds of studio owners across the country! Stephen Tharrett and Mark Williamson, are the founders and owners of ClubIntel, a brand insights firm serving all segments of the fitness industry. Together they have over 50 years of experience in the fitness and hospitality industries. Stephen is a former SVP of Operations at ClubCorp and CEO of the Russian Fitness Group, along with being the author of eight fitness business books, including Studio Success! 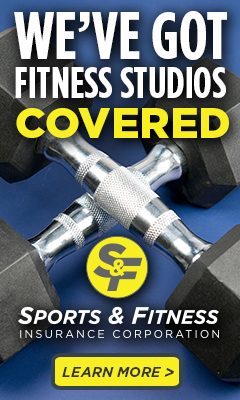 AFS’ Authoritative Guide to Owning & Operating a Fitness Studio. Mark is a former VP of Consumer and Employee Insights at ClubCorp, as well as the former VP of Consumer Insights for Applebee’s, Brinker International and Match.com.